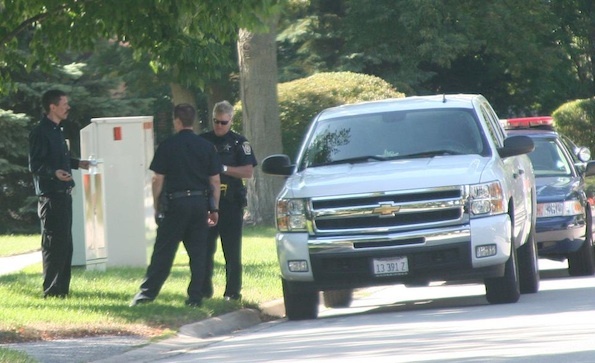 Arlington Heights police apparently question the driver of a white Chevy Silverado about recent suspicious circumstances in the neighborhood just north of Euclid Avenue and just east of Arlington Heights Road (see additional pictures of pickup truck and driver). Arlington Heights police about 9:27 a.m. Saturday stopped a vehicle in the 600 block of North Hickory Avenue that matched the description of several suspicious incident complaints the past few days. An alert police officer stopped the vehicle as police were on the lookout for the vehicle — a white late model Chevy Silverado pickup truck. A male/white or male/Hispanic driver, about 6’1″ with a medium build with a mustache, and wearing all black clothes was the driver and the only person in the vehicle Saturday morning. The driver cooperated with the police. An ambulance responded to the scene a few minutes later, and the man was apparently transported to the hospital. the driver’s Chevy Silverado was towed to a police holding area. The vehicle matching the description was seen by a resident in front of several homes on Thursday night. Police also received a report on Friday that a man in a white pickup truck matching the description stopped by at a house in the neighborhood two times, and said that he was a ‘psychic’ and that he would like the name of the resident’s daughter. The vehicle was last seen Friday night westbound on Hawthorne Street and then southbound on Douglas Avenue. At least one other suspicious incident complaint was also received by police. There may have been additional subjects in the vehicle on at least one of the suspicious incident complaints. The pickup truck had one wood chair in the bed of the pickup. Flowers appeared to be draped above the speedometer area of the dashboard of the white Chevy Silverado.